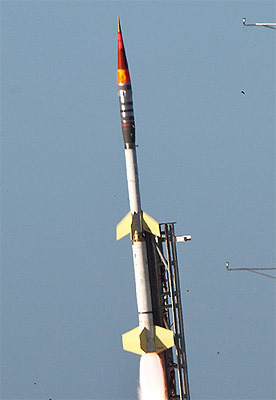 The Terrier improved Orion launch vehicle is a two stage spin stabilized rocket system which utilizes a Terrier MK 12 Mod 1 or Mk70 for the first stage and an Improved Orion motor for the second stage. The Terrier motor is 18 inches in diameter and is configured with 2.5 ft2 or 4.8 ft2 fin panels arranged in a cruciform configuration. The Orion motor is 14 inches in diameter and 110 inches long. The vehicle is typically configured with spin motors and the total weight of this configuration, excluding the payload, is approximately 2,900 pounds. The Improved Orion motor has a bi-phase propellant system (boost-sustain) that results in thrust levels of approximately 19,000 pounds during the first four seconds of motor burn then trailing off to approximately 3,000 pounds until burnout around 25 seconds. The fins are generally configured to provide a burn out spin rate of four cycles per second. The Orion motor utilizes a clamp-released/load-bearing tail can to interface with the Terrier motor. 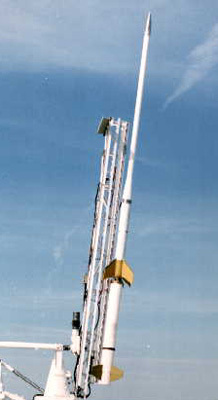 This is a rail-launched configuration that can be supported at most fixed and mobile launch ranges. Payload configurations supported by this vehicle include 14 inch and bulbous 17.25 inch diameters. Payload weights ranging from 200 to 800 pounds can achieve altitudes of approximately 200 to 80 kilometers respectively.